1) Is there a charge to visit Hamilton’s waterfalls? The Hamilton Conservation Area has slowly started to charge parking at their locations, the City controlled waterfalls though are free. 2) Do you have maps of all the waterfalls available? Not at the present time, although we may look at compiling a map of the more accessible waterfalls at a later date. Please bear in mind that some waterfalls are on private property or at locations that can be semi-dangerous to access, so visiting them is not encouraged. Some HCA Maps are available at Upper Gage Garage. 3) Are there tours of the waterfalls? 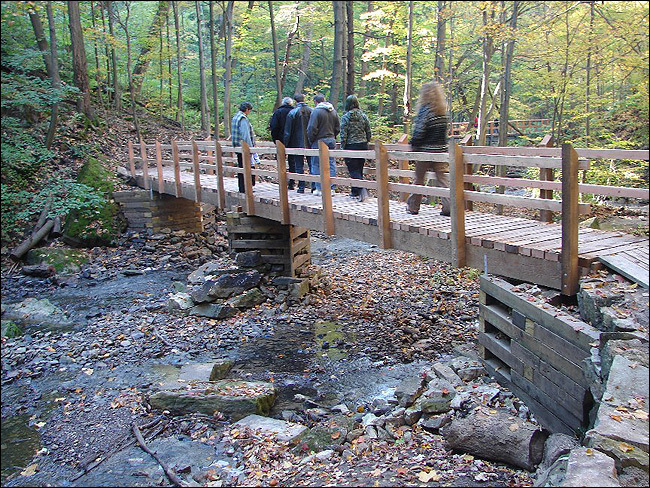 When time permits, the City of Waterfalls team conducts guided waterfalls walks. When one is scheduled, we post the information on our Facebook Group. Anyone may take part in these walks, although some may not be suitable for children because of advanced climbing conditions, etc. 4) Which are the best / most popular waterfalls to visit? Albion Falls and Webster’s Falls are the most popular. We also recommend Baby Webster’s Falls, Billy Green Falls, Borer’s Falls, Chedoke Falls, Darnley Cascade, Devil’s Punchbowl , Felker’s Falls, Great Falls, Hermitage Cascade, Sherman Falls and Tiffany Falls.